For PG&E, just like for AIG ten years ago, this is the beginning of the end. As we discussed on Tuesday, one of the biggest surprises involving the ongoing collapse of troubled California utility PG&E is how it was possible, that with the company reportedly contemplating a DIP loan ahead of a possible bankruptcy filing which sent PCG stock plunging and its bonds cratering to all-time lows, that rating agencies still had the company rated as investment grade. Late on Monday, this question got some closure after S&P became the first rating agency to take a machete to its rating for PG&E, when it downgraded the company by five notches, from BBB- to B, the fifth-highest junk rating while warning that more cuts are imminent. But while S&P slashed PG&E's IG ratings, Fitch and Moody bizarrely had yet to do so, well over a month into the company's death spiral. And when they do, both management, shareholders and bondholders would have nightmare on their hands because a similar "junking" by Moody’s to high-yield would result in a rerun of the AIG death sprial, as at least once cash collateral call for PG&E of at least $800 million - to guarantee power contracts - would be triggered according to a regulatory filing. Well, PG&E's AIG moment hit late on Thursday, when Moody’s did precisely what S&P did two days earlier, and cut the utility's credit rating to junk citing the electric company’s potential wildfire liabilities. The credit grader lowered PG&E’s rating by five notches, to B2 from Baa3, and the utility Pacific Gas & Electric rating four levels to Ba3. Like S&P, the bond grader said it may (read: will) cut the company further, sending PG&E shares and bonds sliding after hours. 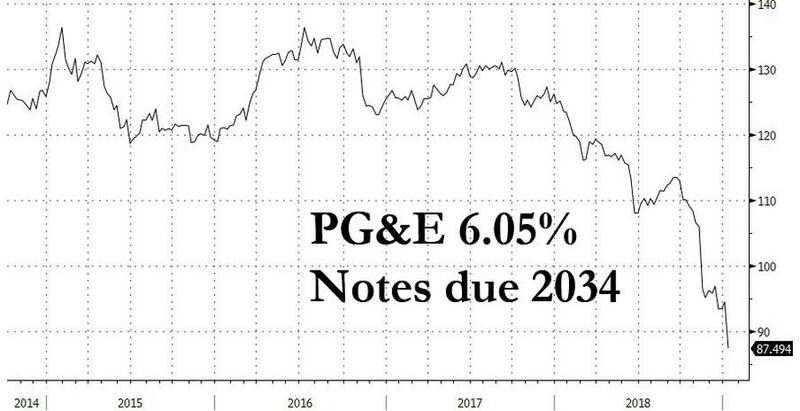 But it wasn't the prospect of more downgrades that spooked the market: it was the fact that with two junk ratings, PG&E will now be required to use cash as collateral to guarantee power contracts, according to the company’s latest quarterly filing, which estimates the utility will have to fully collateralize as much as $800 million of positions.